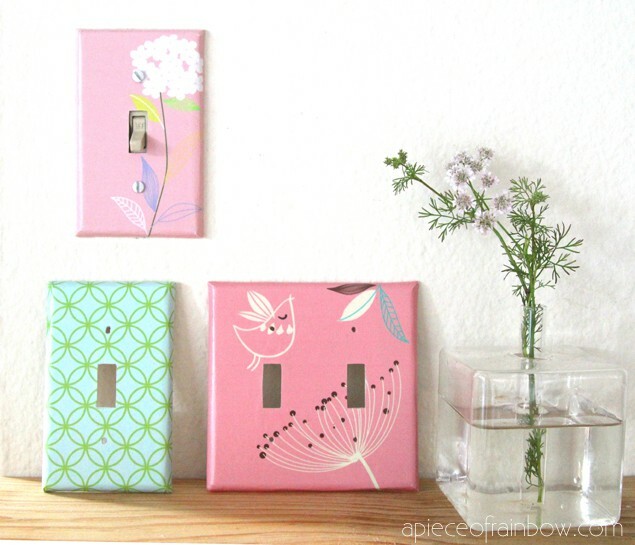 Most switch-plates and outlet covers lack personality and flair. Yet it’s so easy to turn them into something special with very simple materials- paper and Mod Podge. 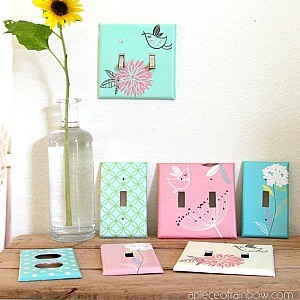 Today I am going to show you how to decoupage your outlet covers and give them an easy and adorable quick makeover. Let me start with an introduction! It is such a great honor for me to be here today, thank you so much Desiree and all the wonderful The 36th Avenue readers! I am Ananda from A Piece Of Rainbow, where I blog about how to bring creative designs into fresh do-it-yourself projects for our homes. And shall we start with those boring switchplates? First gather some designs and patterns you love, or type up some cool phrases in nice fonts – I created some with graphics I have – and print them onto medium weight cardstock. Here I used 200 grams/m² weight, but lighter ones can still works nicely. 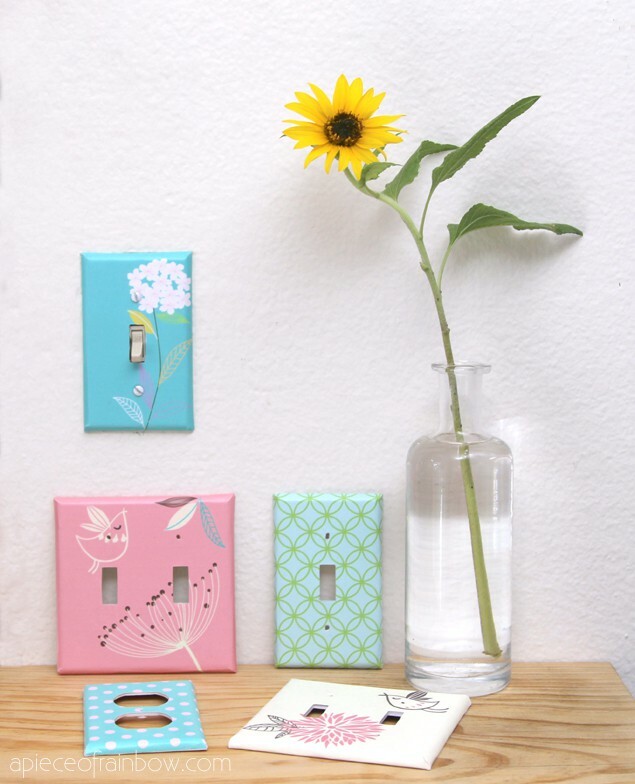 For the single switch plates, the print size should be about 5″x3.25″, and for the double switch plates, print size is 5″x5″. You can use Photoshop or Gimp to size, arrange and print them. 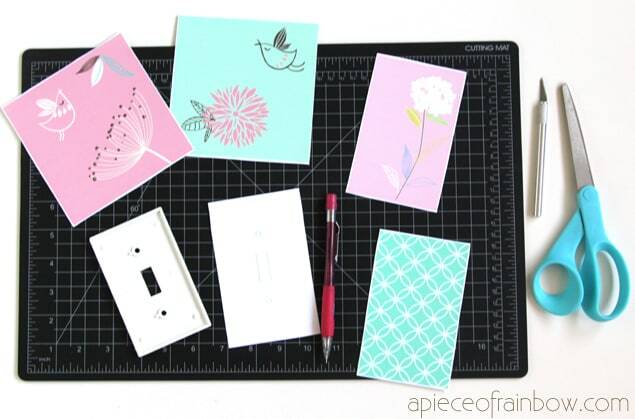 Next cut the pieces to size, trace the openings onto the paper, and cut those out. 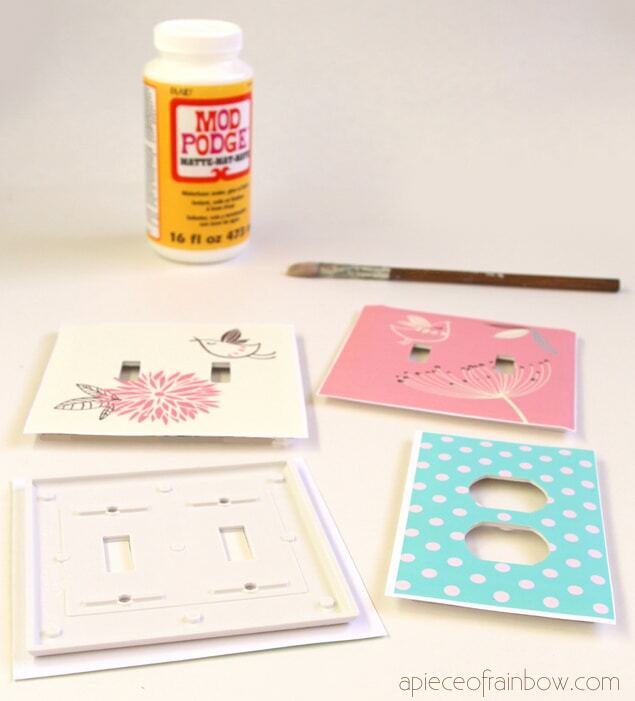 Brush Mod Podge onto the flat surface of the plates, and lay the patterned paper on top, make sure the openings match and edges align nicely. The next step takes a little more patience, but it’s quite easy. Make a small diagonal cut at each of the 4 corners, gently curl and fold the paper following the contour of the plates, trim a bit where there’s too much excess paper. Brush Mod Podge on the inside to attach the paper to the plates. 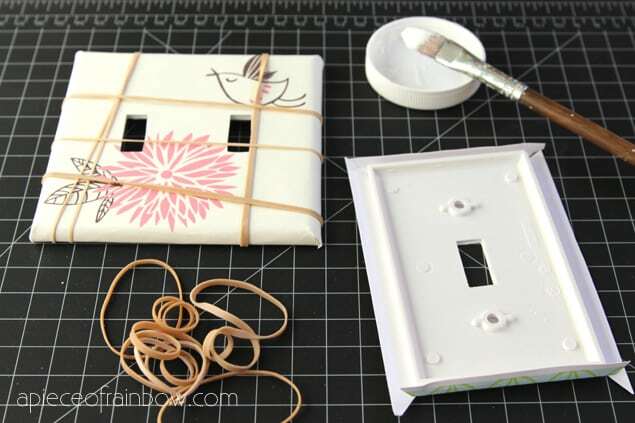 TIP: rubber bands make it easy to hold the shape during the gluing process! 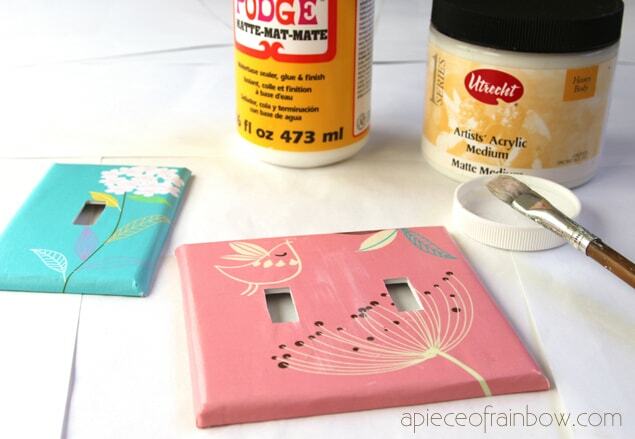 The final step is to coat the surface of these switch plates with 2 coats of Mod Podge or acrylic gel, so they become more water resistant, and in the future easy to clean with a damp cloth. Thank you so much Desiree for having me over at your gorgeous blog! Wish everyone a happy and creative day! Oh my cuteness! I love this project and the colors are adorable! I want to invite you to visit Ananda and check this other projects on her blog A Piece Of Rainbow. How to transfer images to wood. 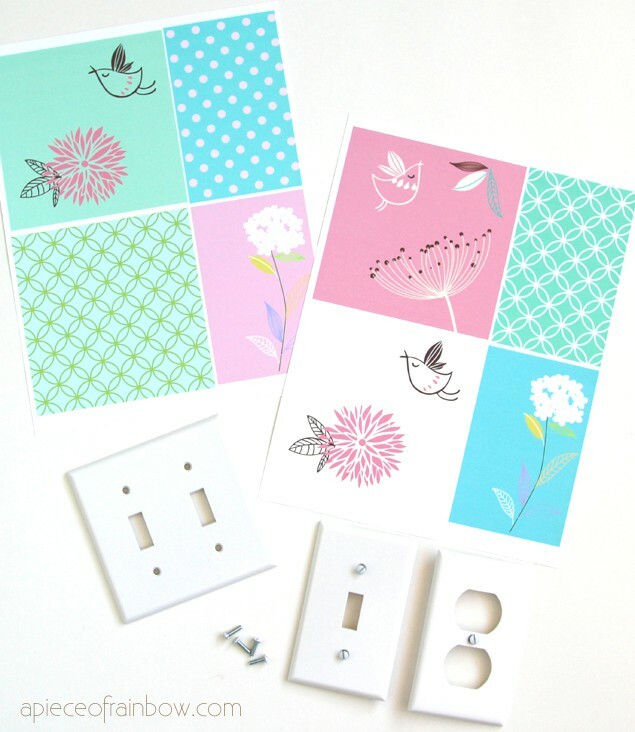 hello I was wondering where you got the pics from for the light switches? They would be perfect for my little girls room. Juanita, she has her prints to download on her website. I struggle with decoupage so I appreciate anyone that can! These are really cute. How about using fabric to match a bedspread or curtain?!? Maybe I’ll give decoupaging a try again. What a great idea! 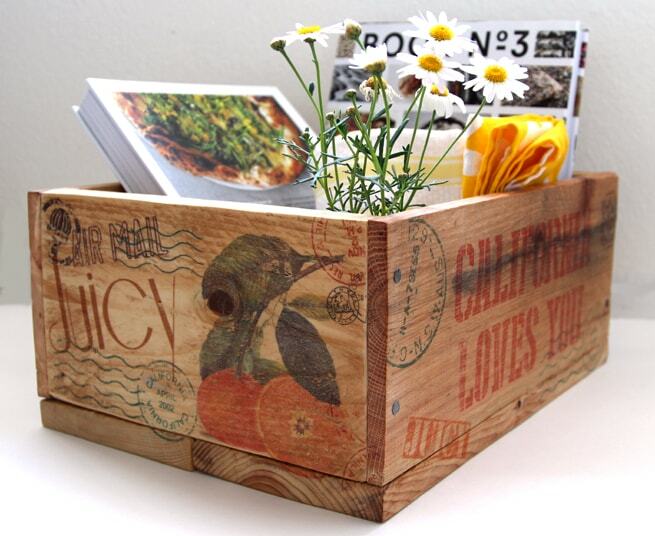 thanks so much for sharing….this will definitely be my next project! Some things you just never think of until you see it. This is such a cute idea. I want to do this for my kids’ rooms. I love that it’s so simple. Thanks for sharing with all of us! Super cute!!! I see a few of these in my future. Thank you gina and happy creating! 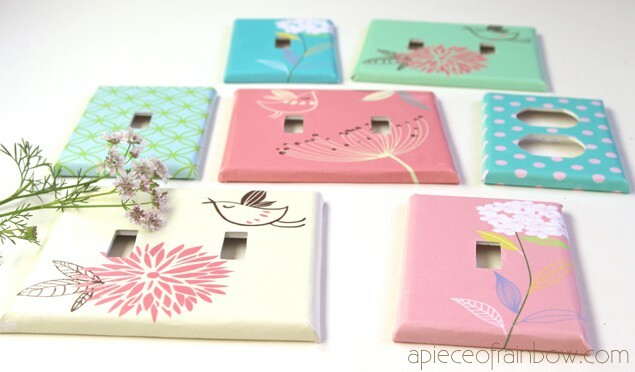 These switch plates will gift my rooms a nice facelift! 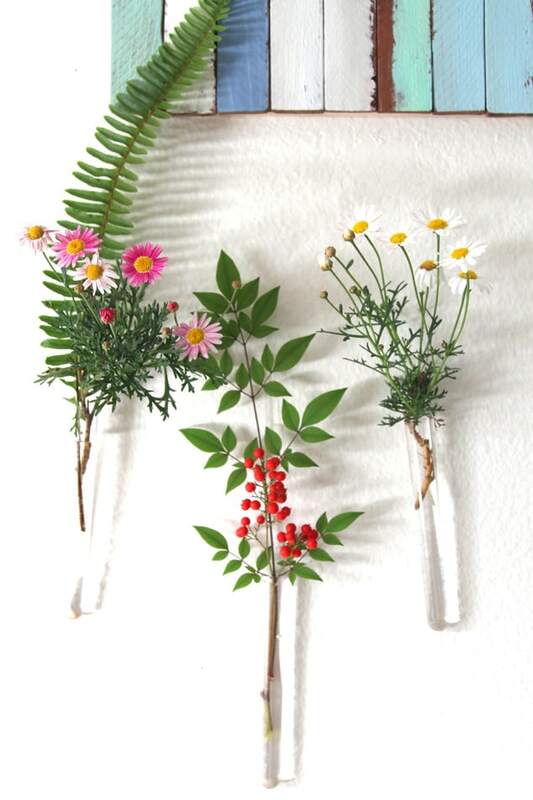 So beautiful and easy to do! Thanks!